As of September 2015, there are 100 million users (and counting) on Pinterest. Users pin over 3,400 images a minute. More than 80 percent of pins are re-pins. By 2019, the number of Pinterest users in the U.S. alone will reach 59.3 million, representing almost 30 percent of American social networkers, predicts eMarketer. The users on Pinterest are also shoppers. A study conducted by Shopify reveals that Pinterest users are 10 percent more likely to make a purchase than users referred from other social media sites. The study also indicates that 93 percent of Pinterest users use it to plan future purchases. A Convertro study indicates that Pinterest drives more revenue per click than Facebook, Twitter, or any other social network. 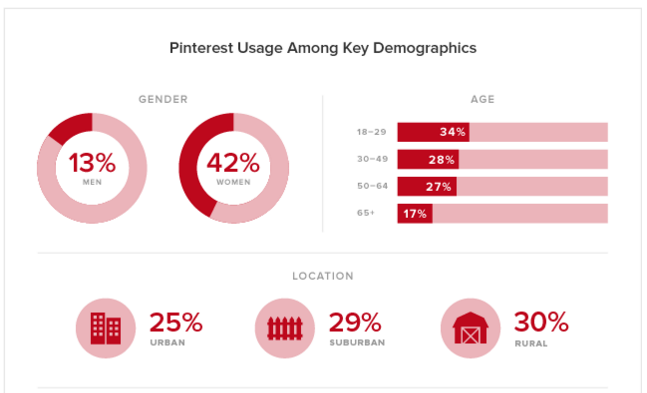 According to findings by a Pew Research study, over one-fifth of U.S. adults use Pinterest as a visual discovery tool. 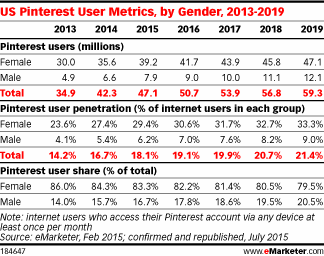 The study also found that although female users dominate Pinterest, the number of men (13 percent as of 2015) using it for photo sharing is also quickly increasing. This means brands that mostly target male audiences can also leverage Pinterest to drive conversions. 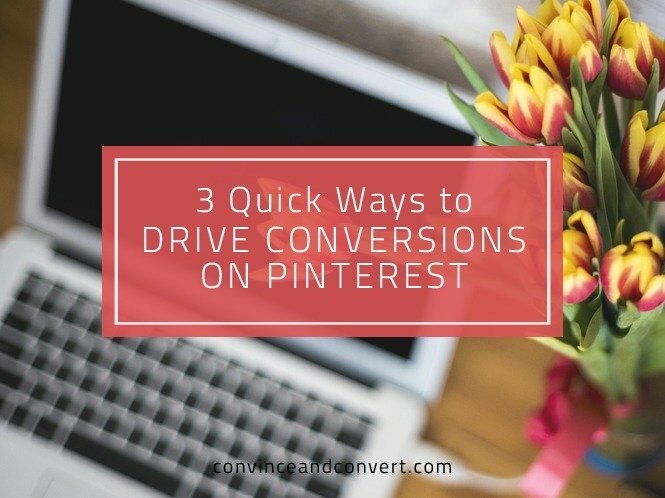 Because people are spending more time interacting with pins, you’ll have more opportunities to expose them to your brand through Pinterest, and convince them to convert, so to speak. But before you get excited and jump onto this visual discovery tool to market your brand, there are three things you need to consider. One of the most interesting statistics about Pinterest comes from Digitas and Curalate, which suggests around “70 percent of brand engagement on Pinterest is generated by users” and not brands. This reveals a huge chasm in marketing strategy, targeting, and messaging. 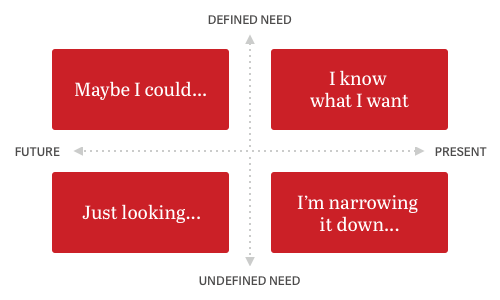 These four modes are based on needs, context, and time. Marketers will find the makeup of Pinterest users’ mindsets to be familiar. They “mirror the customer journey,” meaning the experience starts with simple browsing, and once people come across something inspirational, they will narrow down their choices and finally decide to purchase. To get a better idea of the Pinterest experience, you need to understand users’ psychology and what makes them pin. According to Psychology Today, unlike users of Facebook, Twitter, or other social networks, Pinterest users aren’t prompted to think before posting new content. Rather, they are prompted to feel. Users on Pinterest are simply sharing their tastes and preferences, which removes the thinking tension—an integral part of Twitter and Facebook. This leads back to what marketers have always known: that there are immense opportunities to engage with customers by banking on their feelings. You need to engage with customers and evoke feelings at each step of the buying process. Be diligent about your pins, as they are seen not only by potential buyers, but also by those who are about to be introduced to your brand. Your content, therefore, needs to be compelling enough for both types of users. For example, you can create multiple pin boards including comic strips and memes, infographics, and photos relevant to your target audience. In fact, instead of simply posting your product images, employ different strategies for each pin board to make your boards fresh, fun, and engaging, and avoid being generic. Coupons and photo contests are extremely popular on Pinterest, especially with the addition of words like “discount,” “free,” or “best deals.” If you want to sell your products through Pinterest, nothing will work better than coupons—be they online coupons, in-store coupons, or group coupons. In fact, group coupons are great options if you want to promote a group offer like the one below on Pinterest and other social media sites. The prospect of getting a discount or a good deal always excites people, and when combined with Pinterest’s visual nature, you are more likely to see a dramatic effect on your products’ sales. Setting up coupons on Pinterest is easy. 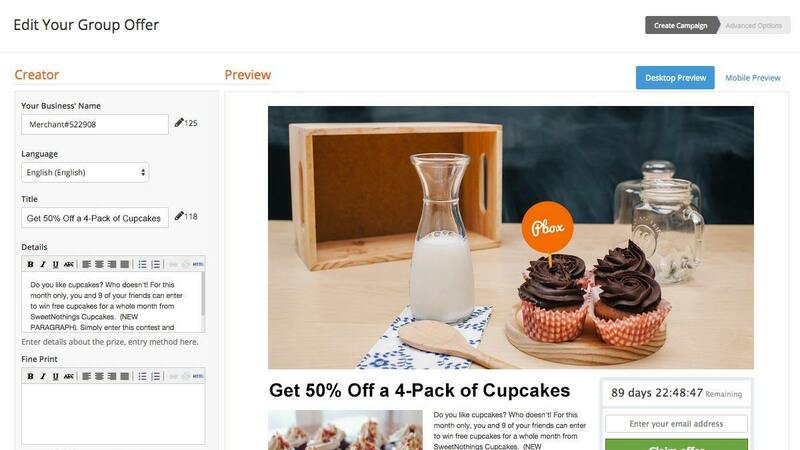 You can use a third-party coupon creation application like Wishpond or run it through your company website directly. Some third-party coupon apps are free, easy to use, and also provide additional marketing tools such as real-time campaign analytics and email databases to help you create and monitor your campaigns and identify new opportunities. Just as you’d create a board for your products, create a coupon board, and pin images of your deals along with other details of the offer. Don’t forget to link to the specific coupon page. If you plan on holding a contest on Pinterest, create your strategy around social-proof and user-generated content, as these are more likely to gain momentum. For example, hold a contest that requires people to submit content to participate—something like a photo-contest where the entry with the largest number of votes for the submitted photo wins the contest. Chances are, the entrants will share the content on their own social channels and endorse your brand in the process. Don’t forget to provide an awesome reward or incentive to get more likes, shares, and re-pins. The last thing you need to consider is optimizing your visual content for Pinterest so it can be easily found. The tactics are simple. Additionally, use targeted keywords in the “About” section, and make sure that the names of your Pin Boards reflect the keywords you want people to search for. In addition, you can link back to your website and provide hashtags in the pins’ description. Finally, you could create a special landing page to increase your Pinterest referral traffic and conversion rate. Yes, people can now make a direct purchase from Pinterest pins. Although Buyable Pins are only available to iOS and Android users in the U.S. for now, it is likely to be extended to other platforms and countries in future releases. A number of popular retailers like Macy’s, Nordstrom, and Neiman Marcus are already leveraging the Buyable Pins. There are more than 100 million users who could be your company’s potential customers. If you think your product is a good candidate for these users, start setting up your Pinterest boards to acquire new shoppers and revenue. Phong Ly is the CEO & co-founder of iSeeCars.com, a car search engine using Big Data to help users find great car deals and save money. With more than 15 years of tech and business experience, Ly has been featured and quoted in many media outlets such as ABC News, Forbes, CNBC, USA Today, Fortune, and Reuters. He earned an MBA from Harvard Business School and BSE in computer engineering from Princeton University.